Mini Titan's frame design can be considered truly revolutionary with the most noticeable change being the position of the main gear and the battery. 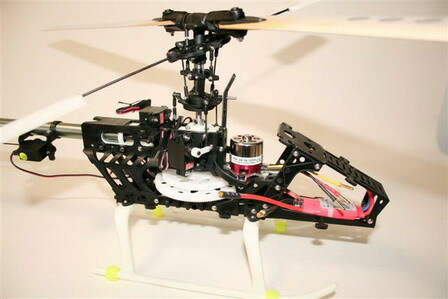 Whereas most other RC helicopters adopt the convention of placing the main gear on top and the battery pack below it, the Mini Titan's main gear is positioned at the lowest possible point in the frame. According to experts, this type of configuration results in a much better roll and yaw response. The battery's position is equally unique. While most models place the battery pack at the bottom center, the Mini Titan's designer boldly chose to place the battery pack at the very front of the model - mounted on an "L" shaped battery tray and suspended at a slanted angle. While some people may think that this type of battery placement will upset the overall balance of the helicopter, many avid pilots claim that the weight of the battery pack balances out with the weight of the receiver, gyro, and the tail boom to create a one of its kind center of gravity, which allows this helicopter to perform maneuvers exceptionally well. The tail system of the Mini Titan is one which truly throws normal convention out the window. The designers have managed to create a tail boom which can be removed and reassembled at will. This is possible because the tail drive system is isolated. As a result, to assemble or disassemble the tail boom takes less than a minute and requires only one screw - which allows this already small helicopter to be even more portable. The motor, servo, and speed controller are all positioned differently from other models. To motor is placed at a slightly forward position, but it is kept as close to the center as possible to counteract any rotational force. The speed controller is places at the front-most and lowest point on the frame. This position is claimed to be the most force-resistant as to protect the circuits of the speed controller in case of a crash. The speed controller and the motor are also located in a way that allows air, both from flight and from the rotor, to effective dissipate heat. Designers of the Mini Titan also claim that the new positioning of the servo mount will result in a faster and more accurate overall response. In flight, the Mini Titan performs outstandingly. With its unique components placement, this helicopter is blessed with a unique center of gravity that allows it to be stable yet responsive. Its maneuverability is as precise and agile as that of a well-established nitro helicopter such as the Raptor. With all the above said, seeing and testing the Mini Titan in flight is breath taking. Unlike other Electric RC Helicopters that are well rated, this model is one that is truly spectacular. Once again, Thunder Tiger doesn't fail to deliver.